We ordered this rug for our a sitting area in our finished basement. It was perfect for that space. The colors were a little lighter than pictured but it worked for us. The only issue we had was there was a fold from it being rolled up that will have to be straightened out. 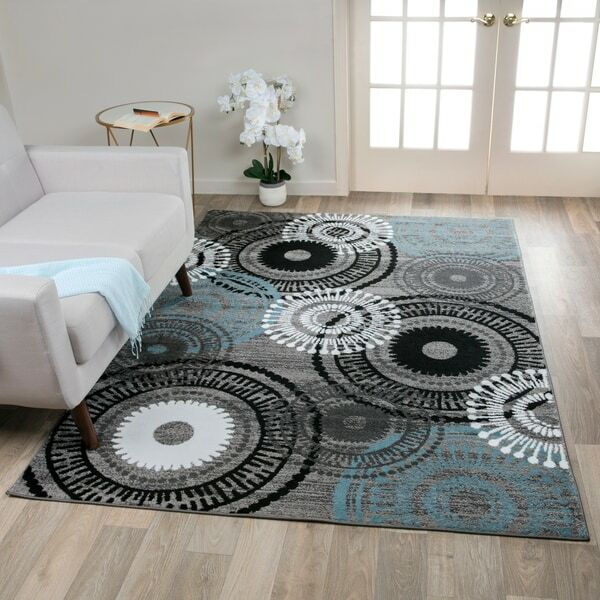 Contemporary Circles Yellow/Grey Polypropylene Area Rug - 5'3" x 7'3"
Cover your floor with this area rug displaying medallions in neutral shades of grey, blue, and white. The dense pile holds its shape to keep the design looking fresh and new. Modern Large Floral Pattern Blue/Grey Polypropylene Area Rug (5'3 x 7'3) - 5'3" x 7'3"